Despite how much I love fall and cooler weather, it’s also during this time of year that my dry, itchy skin reappears. So, to combat the cooler-weather dryness while sticking to my budget (it’s the “don’t-spend-money-on-anything-unless-its-wedding-related” budget. It’s a very unrealistic budget) I set out to make a sugar scrub with ingredients I already had in my kitchen. 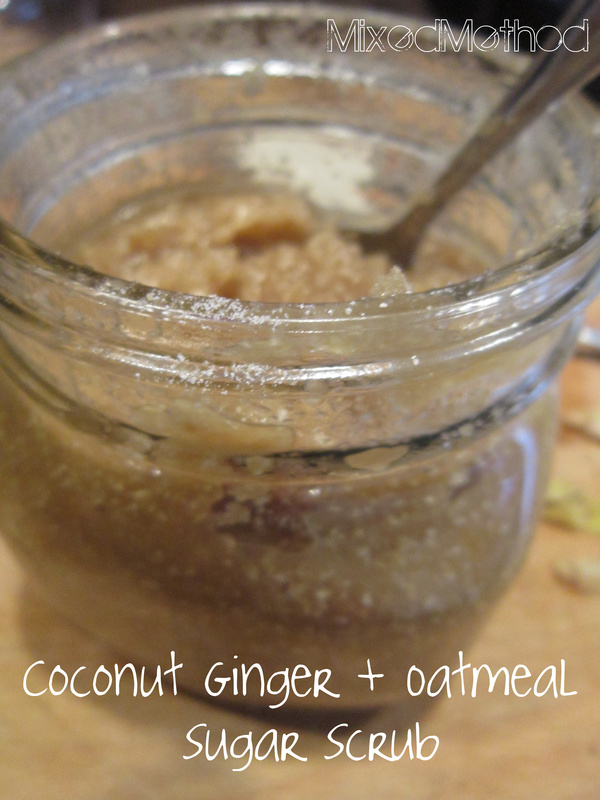 This scrub uses both brown and white sugar, coconut oil, grated ginger and oatmeal, and is totally nourishing. White and Brown Sugars: Natural exfoliates. Exfoliating is an important part of helping skin retain moisture. It helps remove any buildup of old, dry skin sells so that you can then moisturize the new cells underneath. Brown sugar is much gentler than white. Coconut Oil: The benefits of coconut oil are almost countless. Not only can you use it as a healthy oil replacement in recipes, but also for lip balms or hair treatments, and as a massage oil. Rich in vitamin E and protein, coconut oil helps to soften and moisturize skin. 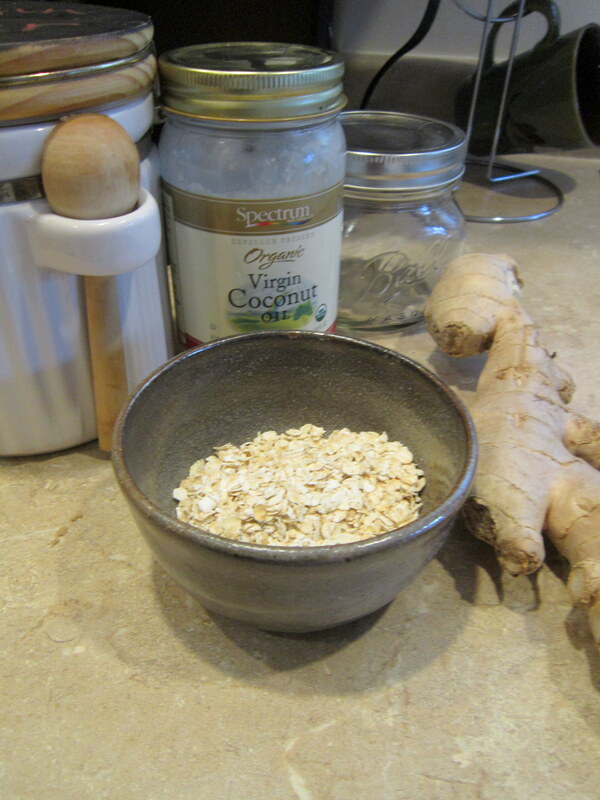 Oatmeal: Like coconut oil, oatmeal has a smoothing and soothing effect on the skin. It contains polysaccharides which help to protect skin from dryness. Ginger: A natural antioxidant, ginger fights free radicals and can also help improve skin tone. Put them all together and you’ve got a pretty awesome and natural skin treatment! Here’s how to mix ’em. *adding the oatmeal is entirely optional. ** As exfoliating goes, brown sugar is gentler than white. You can replace one for the other, if you like. Use all brown sugar, or all white, or both, up to you! You will also need a jar to keep the sugar scrub in. I used this canning jar because I had it on hand. I doubled the recipe to make enough to fill my far. Add Oatmeal to food processor. Process until the oatmeal is ground down into a fine, sand-like texture. Add sugars and ginger and pulse a few times to mix. 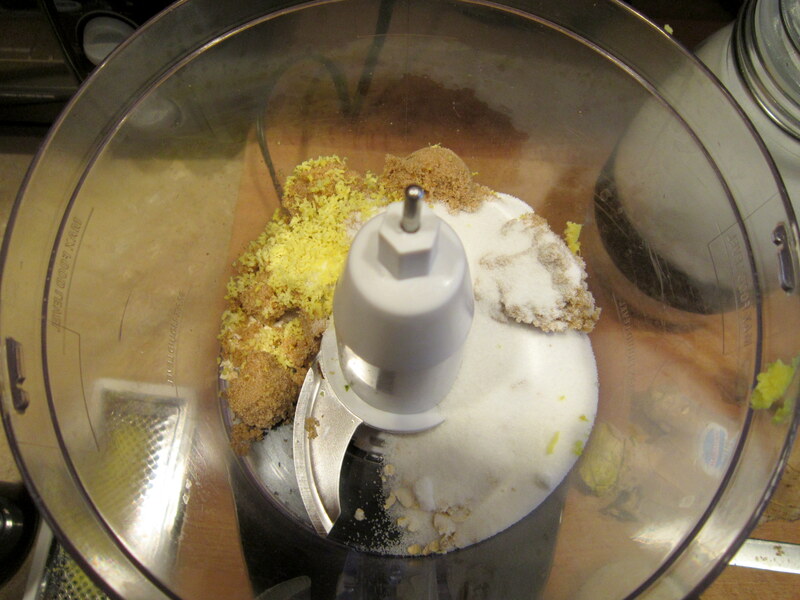 Remove the mixture from the food processor and place into your scrub jar. Put the coconut oil in the microwave (in a microwave safe container) to liquify it, about 20 seconds. Add the liquid coconut oil to your oatmeal and sugar mixture and stir to combine. Now, go take a shower and enjoy your scrub! Because the coconut oil tends to solidify, sometimes it’s best to warm it before use. You can either use a spoon to remove some of the mixture and warm it with your hands as you scrub, or run the jar (with lid on) under hot water for a few seconds before using it. If you use the scrub once a week, you’ll see a big difference in how your skin looks and feels! Next postMidweek Manicure // More Polka Dots! How long can this scrub keep in a jar?